Lunchy goodness on the fly! I came home today with a need to do something for lunch tomorrow. I went out and bought my lunch today and the way I feel is that I really should not have to spend that much money for an @#&@$@# salad! $8 for a salad! So I looked in my fridge and my pantry and I thought, “I can work with this.” . 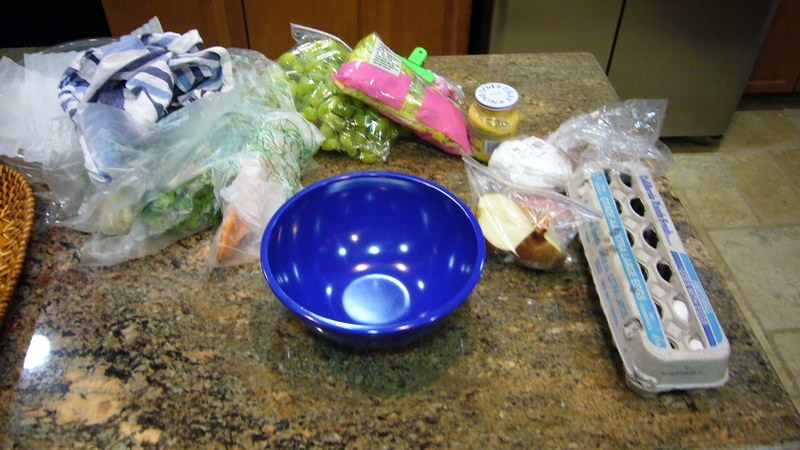 I think I’ve heard many cook’s say the key to cooking well is having the supplies on hand. Well in this case I see what they were saying! I had defrosted some lean ground beef the previous night for dinner tonight and so I had about 150g of it ready for me. 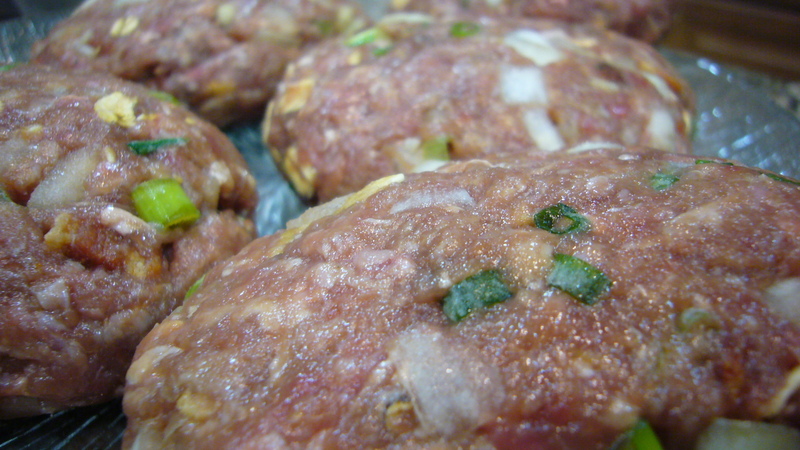 I had been thinking that I wanted to make some kind of meat ball. I find them easy to pack into my lunch and I can pack in a lot of flavor without stinking out my office when I eat them. I also have some pancetta that I am trying to find things to put it in or use it up. So what I did was chopped up 30g of pancetta, maybe a bit more. When I put it in the pan it was a little less then a hand full and I let them cook in a pan on medium low heat until cooked crisp, but not black. I then put them aside to cool. 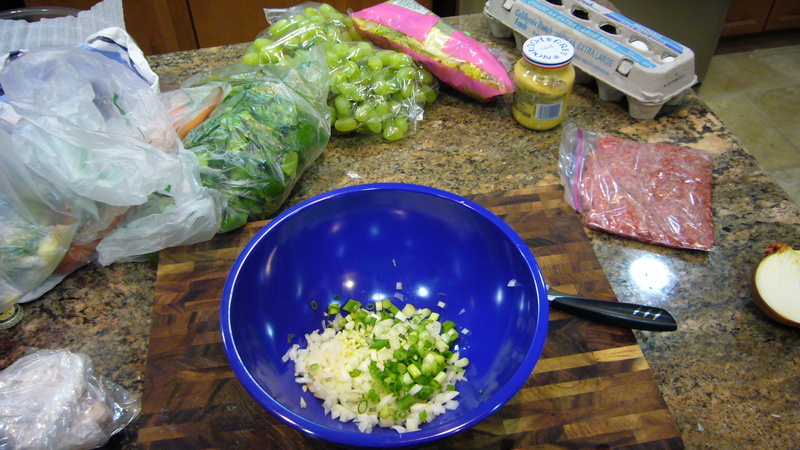 While the pancetta was cooking I mixed together some of the other ingredients that I had figured on putting in. I mixed it all together with my hands. I love getting my fingers into food, that half to the fun of cooking! 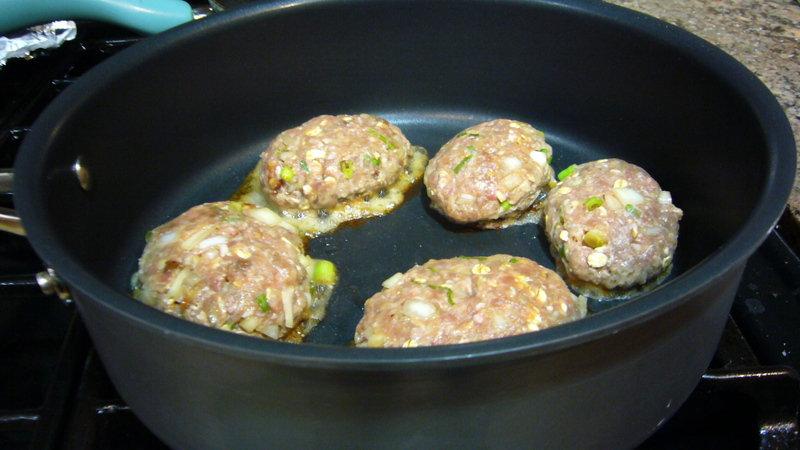 When everything is mixed together I formed some hamburger patty’s of as equal size as possible and started to preheat my pan so that could sear them a bit before putting them in the oven. I like getting a good sear on meat. I seared in on one side then turned them over and popped them in a 400 degree oven for about 10 minutes. I might play with that time and temperature a bit when I make these again. They came out gorgeous!!! I could not have been more pleased! The taste brought a smile to my face and I wanted to share. Thank you Tom for being such a gracious Guinea Pig. I knew the meat patty’s were good, but I just needed some see a face that would show me a reaction when eating them. I like a good I’m-gunna-marry-this-food reaction! 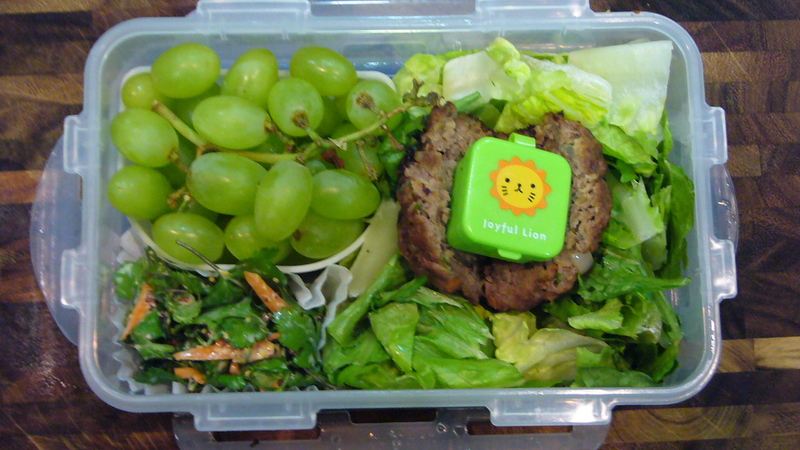 The patty was placed in my lunch box on a bed a of romaine lettuce and there are some green grapes and small Cilanto/carrot salad a well rounded lunch. 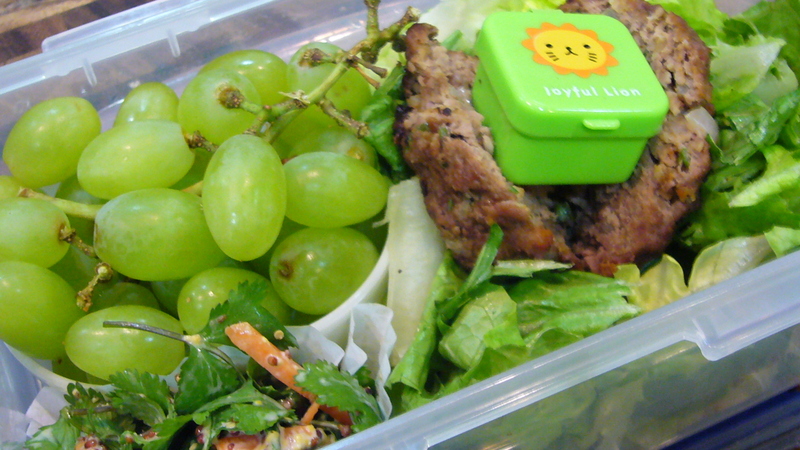 I better not forget my lunch tomorrow! ← White wine reduction heaven! Yum. That looks delicious and juss like the stuff we like to eat at our house. I usually let my husband mix the meat with his hands though! Thanks! I love getting my hands in food. Textures are my thing! I understand about the raw meat at any rate. I have had a lot of friends that don’t like to touch raw meat. Glad that you enjoyed.